We offer Printing Pads. Also customized in accordance with substrate requirements at our in-house production center. The soft and hard quality screen printing pads are developed taking into consideration production speed, etched depth, ink and solvents in use. We are manufacturer and supplier of printing pads. All the pads are tapered & sloped at the side. The taper pad influence the ink pick up, ink transfer, print quality & print size. Even the surface tension of the pad influences the print quality. A new pad with smooth surface has good ink picks up & transfer property. We are identified as one of the most accomplished firm of this industry, involved in offering an extensive series of Pad Printing Pad. Available Shapes: Square, Rectangle, Round etc. We are manufacturer and supplier of Prinding Pad . All the pads are tapered & sloped at the side. The taper pad influence the ink pick up, ink transfer, print quality & print size. Even the surface tension of the pad influences the print quality. We offer all kinds of tampons or pads which are made from 100% raw materials that are used for Printing Pads. These pads are very durable and have very long life. 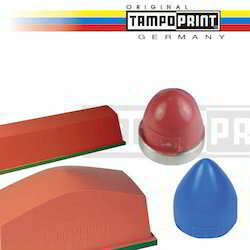 We are ranked amongst the trusted firms engaged in manufacturing a wide range of Silicone Printing Pad.